We’re off! We are on our way to New Hampshire and Connecticut to spend some time with our kids before we go south for the winter. Right now there are no specific plans of what to see along the way, and we have no reservations. We’re just going to “wing it” and see what happens. Our plans were to leave this morning, but it was raining and the wind was increasing so we thought maybe we would have to leave tomorrow instead of today. By mid-afternoon we decided we would go today anyway. It rained off and on and the wind wasn’t too terribly bad after all. We headed to Minneapolis and took I-35 south driving only about 175 miles to Albert Lea, Minnesota. 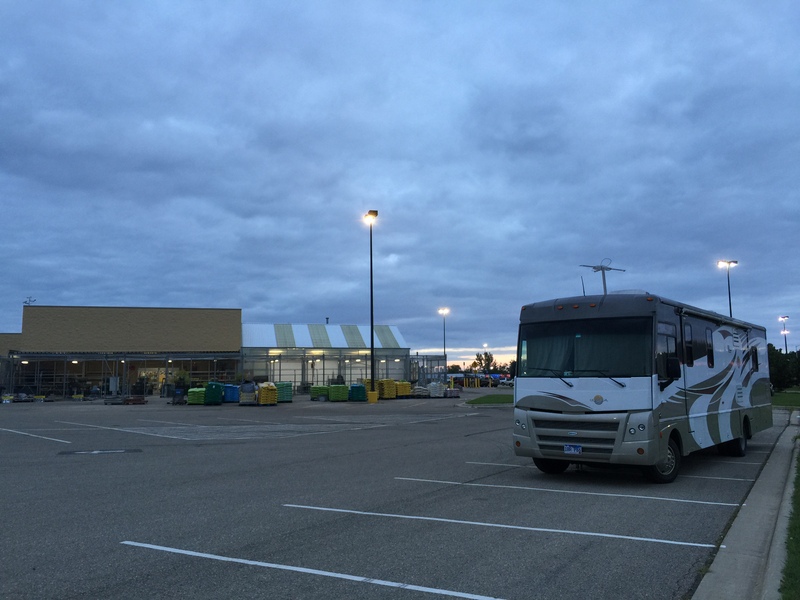 Our first night on the road this time around will be spent in a Walmart parking lot. Not glamorous but will do for a night. We’re just passing through. Not much for a first day blog entry, but I never said it would be exciting. We’re always watching gas prices. Today we saw prices of $2.66/gallon and $2.77. This entry was posted in August, Daily Post, Minnesota and tagged Walmart, Walmart Overnighting. Bookmark the permalink.